Last week I shared the five important things I’ve learned along the way about vintage shopping. 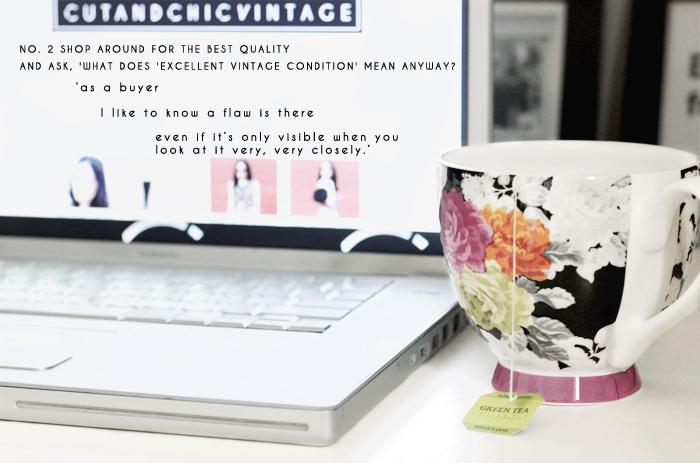 This time I’m sharing my five tips to buying vintage fashion online. I know it can be a bit scary shopping for your vintage online, but it can be pretty awesome too. You may not be able to try a garment on before buying it, but you do get a wider selection of vintage finds to choose from without having to do all the tedious rummaging yourself. Buying vintage fashion online is really not that intimidating once you get the hang of it. 1. Always have a measuring tape handy. I know I’ve already harped on about this in last week’s post, but I cannot stress enough how important it is to know your own measurements. Most vintage sellers will have the garment’s measurements in their listing’s description. Some will also give an approximate size for reference. Knowing an approximate size is alright as a starting point, but it’s important to remember that one garment maker’s size medium may be a size small to another. A better test is to take a similar item in your closet, lay it down flat to take its measurements, and then compare those measurements with the garment you’re considering to buy. 2. Shop around for the best quality and ask, ‘What does ‘Excellent vintage condition’ mean anyway? The great thing about shopping online is you’re connected to vintage sellers from around the world without even having to leave your bed! Take advantage of that and search on Google, Etsy, and Ebay to shop around. I prefer sellers who are very descriptive of their items, have loads of quality photographs, and explain why something is in ‘good condition’ as opposed to ‘excellent vintage condition.’ I must admit though, I’m always a little worried when I read something is in ‘excellent vintage condition.’ As soon as I see those words, I think, “Is there more to this garment that I need to know that isn’t being mentioned?” Does it mean it’s a vintage blouse that’s in excellent condition and doesn’t look worn at all or does it mean it’s a vintage blouse that’s in excellent condition for something that is vintage and has some minor signs of wear that aren’t noticeable? It’s important to remember that vintage fashion is obviously not brand new and will most likely show some signs of age, but as a buyer I would still like to know that a flaw is there, even if it’s only visible when you look at it very, very closely. This is where extra information and photos come in handy. 3. When in doubt, ask. Why let something go by when you know it’s one of a kind and you won’t find anything like it anywhere else? At my Etsy shop I always encourage prospective customers to get in touch if they have a question. One of the questions I get most often are about an item’s ‘true color.’ Understandably so, because it’s a fact that computer screens can differ in how they display color. If the item is red, I try to give them examples of what the red is like, for example it’s a ‘burgundy red’ or it’s a ‘fire engine red.’ In addition, I send them a photo of the item next to other commonly red items, like an apple or a bottle of nail polish, for comparison. Feel free to ask for additional photographs. I know that other sellers online, particularly on Etsy, provide great customer service and typically answer your questions within 24 hours. 4. Read the shop policies. Every seller’s shop policies will be different. Some accept returns within a certain time frame. Others have a no returns policy. Best to get to know what a seller’s shop policies are before hitting the ‘Checkout’ button. On Etsy you can find the seller’s shop policies in two places: (1) under a tab within every item’s listing and (2) on the shop’s main page on the left hand side just underneath the shop’s ‘About’ info. 5. Authenticity is in the label. Whenever possible I add a photo of the garment’s label. Reputable vintage sellers and avid vintage collectors love a vintage label because it tells a lot about the garment’s origin, particularly the designer and when the item was manufactured. However not all vintage garments will have a label, but those that do are great to keep around for reference. Look out for them, particularly if the item listed is from a high-end designer. You want to make sure you’re paying for an original and not a fake. Visit the Vintage Fashion Guild’s Label Resource page for examples of vintage labels that are categorized by designer. What have been your experiences on buying vintage fashion online? Share us your stories in the comments section below. Previous Post OOTD: Today, I’m Partying Like it’s 1959. Next Post Shop Update: It’s All About Fall Fashion Vintage Style!